Another reason the military decided to work with dolphins is that they see that they can easily adapt to different environments. Also, they work comfortably and safely even in close contact with humans. Interestingly too, their echolocation abilities are still far better than any electronic device. Below are some important facts about military dolphins. What Countries Use Military Dolphins? So far, there are 4 countries in the world recognized for training and using military dolphins. They are the United States, Russia/the Soviet Union, Ukraine, and Iran. The US Navy first showed interest in dolphins in the 1960s when they implemented the Navy’s Marine Mammal Program. The program didn’t include dolphins’ training, but rather it was a research program destined to improve the naval structures by learning how dolphins are able to swim and dive and use echolocation. However, with time the training possibilities for dolphins became obvious and the US Navy soon switched focused to turning the dolphins into valuable military assets. The Soviet Union Navy soon started their own program in 1965 and during the Cold War, both parties used military dolphins for very specific tasks. Much of the information is classified, as expected, but there was a research facility that studied dolphins near Sevastopol. After the fall of the Union, the facility was taken over by Ukraine. Ukraine didn’t have the resources to continue the research and sold the trained dolphins to Iran in 2000, who continued the research. Because military operations are largely classified, information on all the duties of military dolphins is sketchy. Especially in countries outside the USA. What Can Military Dolphins Do? Because of the secrecy surrounding military operations, there has been much speculation regarding the tasks the navy has trained them to accomplish. Some theories suggest they were used as kamikaze warriors to destroy enemy submarines and even to carry poisoned darts. The official version of the US Navy is that they never trained the dolphins to injure humans or carry weapons that can destroy ships. Dolphins have outstanding biosonar. As a result, they are invaluable for quickly detecting underwater mines and submarines. Military dolphins were used during the Cold War to spot suspicious objects or individuals. The Soviet Navy trained dolphins to plant explosives. They can also detect sunken ships and torpedoes. Currently, dolphins are used to rescue naval swimmers and recover lost objects. 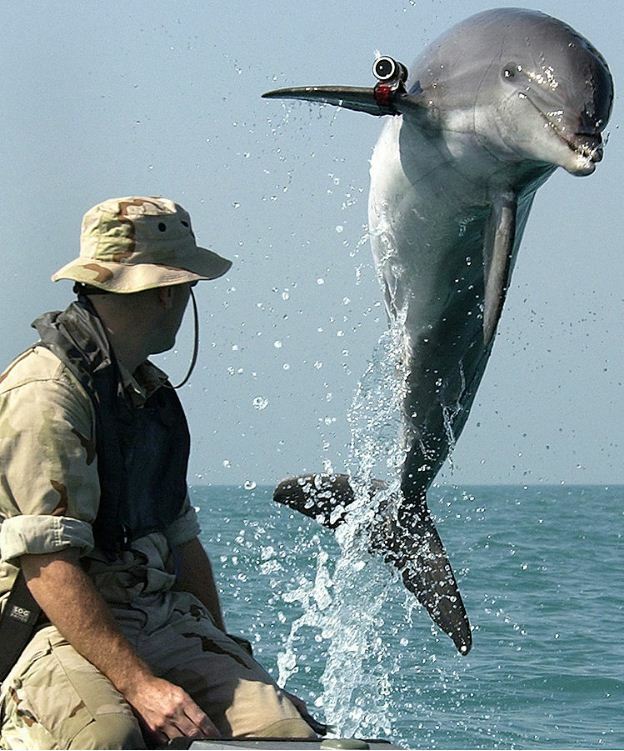 Military dolphins can detect intruders in a limited area and act as underwater access control. Military dolphins are very useful and they can perform various tasks successfully. But at the same time, there are some aspects that raise concerns. Animal activists for instance, have continuously criticized the use of dolphins for military purposes. Their reasons are straightforward: the dolphins are kept in captivity, they are subject to greater stress, they are put in danger and they can become targets. However, the military counters that by insisting that the dolphins are not only well fed but also kept in optimal health. To date, the US Navy is the only military that has shown consistency in their dolphin training program over the years. They have used military dolphins on several occasions: during the Cold War, and the Tanker War. Military dolphins were also used to protect the Republican National Convention in 1996 outside San Diego. Nine years later, dolphins were used to clear mines during the invasion of Iraq led by the USA.